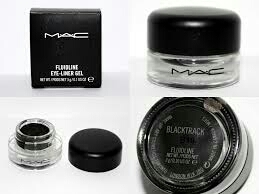 3 WAYS TO REVIVE YOUR DRIED OUT MAC BLACKTRACK FLUIDLINE! I know that I am not the only one who has had a problem with my Blacktrack drying out after I accidentally left it open a little too long! SO I did a little research and composed the top 3 tips I found on reviving your dried out Fluidline! 1. Add 1-2 drops of Saline Solution ( try adding the saline and sealing the lid tight, if this doesn’t quite do it you can try using a clean tooth pick and actually mixing the saline into the liner, then seal tight and use as normal. 2. Submerge the sealed liner pot into a hot cup of water for 20 minutes. Then remove and use as normal. 3. Add one drop of Olive Oil into the pot then use your eyeliner brush. Slide (not mix) the oil all over the eyeliner. Screw the lid back on and use like normal.